This article is about the Gaelic kingdom. For other uses, see Thomond (disambiguation). Thomond (Classical Irish: Tuadhmhumhain; Modern Irish: Tuamhain) was a kingdom of Gaelic Ireland, associated geographically with present-day County Clare and County Limerick, as well as parts of County Tipperary around Nenagh and its hinterland. The kingdom represented the core homeland of the Dál gCais people, although there were other Gaels in the area such as the Éile and Eóganachta, and even the Norse of Limerick. It existed from the collapse of the Kingdom of Munster in the 12th century as competition between the Ó Briain and the Mac Cárthaigh led to the schism between Thomond (North Munster) and Desmond (South Munster). It continued to exist outside of the Anglo-Norman controlled Lordship of Ireland until the 16th century. The exact origin of Thomond, originally as an internal part of Munster, is debated. It is generally held that the Déisi Muman pushed north-west starting from the 5th to the early 8th century, taking the area from the Uí Fiachrach Aidhne of the Connachta. Eventually, the Dál gCais rose to power in all of Munster, to the detriment of the Eóganachta. The person most famously associated with this is Brian Bóruma, High King of Ireland, best known for his feats at the Battle of Clontarf. Four generations down the line and after providing three more High Kings, the Dál gCais were unable to hold onto all of Munster and so Thomond came into being as a separate entity. Between the mid-12th and late 13th century, when much of Ireland came under direct English control and/or settlement, Thomond too came into the Anglo-Irish sphere. The de Clare family established a colony at Bunratty, while the Butler and FitzGerald families also made inroads. However, from the time of the Battle of Dysert O'Dea, Thomond was restored as a kingdom, with its rulers reinstating Limerick within their overrule. Not until the 1540s did the ruling O'Brien dynasty accommodate with English rule. County Clare was sometimes known as County Thomond in the period immediately after its creation from the District of Thomond. "The principality of Thomond, generally called the Country of the Dal-Cais, comprised the entire of the present Co. of Clare, the Parishes of Iniscaltra and Clonrush in the County of Galway, the entire of Ely O'Carroll, the Baronies of Ikerrin, Upper and Lower Ormond, Owney and Arra, and somewhat more than the western half of the Barony of Clanwilliam in the County of Tipperary; the Baronies of Owenybeg, Coonagh and Clanwilliam, and the eastern halves of the Baronies of Small County and Coshlea in the County of Limerick." The entire Province of Munster was under the control of the O'Brien (Ua Briain) clan under the leadership of Toirrdelbach Ua Briain and his son Muirchertach from 1072-1114. Their capital was located in Limerick. 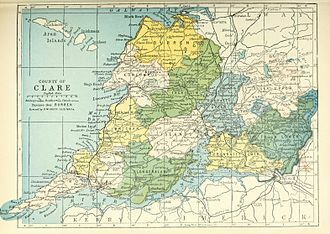 In a bid to secure the High Kingship of Ireland for the clan, Muirchertach encouraged ecclesiastical reform in 1111 with the creation of territorial dioceses over the entire island. They had support for their bid from several foreign connections including the Norwegian king Magnus Bareleg and the Anglo-Norman baron Arnulf de Montgomery, who were both united to the clan through marriage in 1102. Their claim to the High Kingship was countered by the O'Neill (Uí Néill) clan in Ulster under the leadership of Domnall MacLochlainn of Ailech. Though Muirchertach campaigned hard in the north, he was unable to obtain the submission of Ailech. When he fell ill in 1114 he was deposed by his brother Diarmait. Muirchertach did briefly regain power, but after his death in 1119 his brother's sons took control of the clan. MacLochlainn's plans to restore the High Kingship to the north was thwarted by his ally Tairrdelbach Ua Conchobair of Connacht who formed an alliance with the O'Brien's. In 1118 Conchobair partitioned Munster between the sons of Diarmait and Tagh Mac Carthaig. The northern section of the province became the O'Brien Kingdom of Thomond (Tuadh Mhumhain "North Munster") and the southern became the Mac Carthaigh Kingdom of Desmond (Deas Mhumhain "South Munster"). From the 12th to the 14th centuries, the Norman invasion and their multiple attempts to take Thomond from the Gaels was the main challenge to the realm. The picture was complicated by rival branches of the Ó Briain trying to ally with various different Normans to enforce their own line as reigning over Thomond. At the time of the Norman invasion of Ireland in 1169, Domhnall Mór Ó Briain was king of Thomond. Domhnall was a man of realpolitik; his main concern was upholding his position in Thomond and was not against collaborating with Strongbow and others against rival Gaelic kingdoms such as Ossory, Desmond and Connacht. Domhnall even acknowledged Henry II as Lord of Ireland at Cashel in 1171, but a mere two years later when Plantagenet tried to grant Thomond to Philip de Braose this situation was overturned. The Dál gCais defeated a Norman army at the Battle of Thurles in 1174, where over 700 were killed. The following year when Raymond le Gros captured Limerick through a naval invasion, Domhnall re-took it and burned it rather than have it in foreign hands. [nb 1] The twenty years after that for the Gaels of Thomond were more secure. After the death of Domhnall Mór a period of destructive feuding among his offspring caused a great territorial decline in Thomond. The brothers Muircheartach Finn Ó Briain and Conchobhar Ruadh Ó Briain fought with each other, seeing Muircheartach's reign interrupted between 1198-1203. Muirchertach himself was blinded by the Normans in 1208 and was soon forced into abdication due to no longer being righdamhna. Donnchadh Cairprech Ó Briain had to deal with dissent from the Mac Con Mara and Ó Coinn against his rule, so brought in the Laigin's Mac Gormáin as his standard bearers. Donnchadh also enlisted the support of the de Burgh and other Normans in this fight, which came at a costly price; Limerick and lands surrounding it in what would later become County Limerick and County Tipperary. [nb 2] Under pressure from the Butlers, Thomond was now not too different to what would become County Clare, protected by the River Shannon. Donnchadh moved his capital to Clonroad. The Normans advance continued during the reign of Conchobhar na Suidaine Ó Briain, as Henry III "granted" lands to Robert de Muscregos and John Fitzgeoffrey. Of the two de Muscregos was most active, constructing Clare Castle and Bunratty Castle with a colony. The precedent for Thomond was very dangerous as, should much more land have been taken, the realm would have no longer existed. Conchobhar and his fiery son Tadhg Cael Uisce Ó Briain took up arms and slaughtered many of the Norman settler-colonists in 1257. The following year, the Gaelic chiefs from all over Ireland had resolved to form an anti-Norman pact and met at Cael Uisce, near Lough Erne to discuss terms. They planned to resurrect the High Kingship of Ireland, with most supporting Brian Ó Néill as the choice. Tadhg was proud and stubborn, declaring his father should be High King; the Dál gCais thus did not take part in the Battle of Druim Dearg, which the Gaels lost, damaging the reputation of Thomond as a consequence. Donnchadh mac Brian Ó Briain's quest ended when he drowned in the River Fergus. Brian Ruadh Ó Briain kept the pressure up by burning Clare Castle and forcing the de Muscregos' to flee to Wales, but he had troubles from his own countrymen. The Mac Con Mara, Ó Deághaidh and Mac Gormáin clans supported his nephew Toirdelbach Ó Briain, a son of Tadhg Cael Uisce, for the kingship instead and revolted. Seeing an opportunity, Edward II offered Thomond to Thomas de Clare if he could take advantage of the Ó Briain feud. The events which followed have passed down to history as the Cathreim Thoirdhealbhaigh. After Brian briefly regained Clonroad with de Clare's help, Toirdelbach arrived with support from Galway in the form of the de Burghs and once again took control in 1277. Brian was executed by his "ally" at Bunratty, but de Clare was soon reconciled with his son Donnchadh mac Brian Ó Briain and supported him against Toirdelbach. The feud continued until Donnchadh drowned at a party on Islandmagrath, on the River Fergus. With Toirdelbach now undisputed king, the Mac Con Mara were able to hound de Clare. The conflict between the two lines continued into the next generation between Donnchadh mac Toirdelbach Ó Briain (backed by William Liath de Burgh) and Diarmuid Cléirech Ó Briain (backed by Richard de Clare). There was military success at Bunratty in 1311 for Diarmuid and his cousin Donnchadh was killed at Corcomroe. Following this, Clann Tadhg's leader was Muircheartach mac Toirdelbach Ó Briain and after Diarmuid's "sudden" death, Clann Briain Ruadh's leader became Donnchadh mac Domhnall Ó Briain. The Bruce Wars in Ireland added an unpredictable element and saw some surprising ad hoc alliances come into play. Donnchadh elected to support Edward the Bruce, which made his patron de Clare an enemy. Muircheartach who now reigned supreme in Thomond, due to his connection to de Burgh, was nominally on the side of the Lordship of Ireland. The cousins fought at the Second Battle of Athenry. Muircheartach's brother Diarmuid mac Toirdelbach Ó Briain managed to destroy Donnchadh and most of Clann Briain Ruadh's supporters at the Battle of Corcomroe in 1317. The end of the de Clares and Norman territorial claims in Thomond came the following year at the Battle of Dysert O'Dea, due largely to Conchobhar Ó Deághaidh, whose tactics secured a famous victory. The last successful attempt by a Norman to play divide and conquer within the Thomond kingship was the case of Maurice FitzGerald, Earl of Desmond. A very powerful man, he was constantly rumoured during his life to have wanted to make himself King of Ireland. He successfully sponsored Brian Bán Ó Briain in overthrowing Diarmuid from Clan Tadhg during 1343-1350, but equally decisive was the sides taken by Mac Con Mara, leading to Diarmuid's restoration. With the exception of a failed Norman attempt to reconstruct Bunratty Castle by Thomas de Rokeby from 1353-1355, the Norman settler-colonialist project in Thomond was at an end until the submission of the Ó Briain in the 16th century. The Norman Lordship was weakened by the Bruce Wars of 1315-1318, the Black Death of 1349-1350 (which disproportionally hit Norman controlled towns) and besides that English forces were more invested with the Hundred Years' War in France and their own internal conflict the Wars of the Roses to focus too much on Ireland. All of these factors allowed for a 15th-century Gaelic resurgence, not only in Thomond but across a significant part of Ireland outside of the Pale. Brian Bán was the last of Clann Briain Ruadh to hold the kingship and from 1350 onwards, Clann Tadhg held sway. Mathghamhain Maonmhaighe Ó Briain came to power before the death of his uncle Diarmuid and he was named as such because he spent time as a foster child in Máenmaige. His succession was disputed by his uncle and brother; Toirdelbhach Maol Ó Briain and Brian Sreamhach Ó Briain. Of the two Brian Sreamhach gained the upper hand and when his uncle tried to enlist the help of the Earl of Desmond to wrestle back the realm, Brian thoroughly routed them at Croom in a key military success. This had the added benefit of winning back Limerick for Thomond and Sioda Cam Mac Con Mara was placed in the city as a warden in 1369. The friendship with the de Burghs of Galway was maintained by Brian and when Richard II was at Waterford in 1399, he paid nominal homage and was well received. Thomond was now in such a position that Conchobhar mac Mathghamhna Ó Briain's twenty six-year reign was marked as a time of peace and plenty. The years 1426-1459 were marked by a succession of three sons of Brian Sreamhach reigning; Tadhg an Glemore Ó Briain, Mathghamhain Dall Ó Briain and Toirdelbhach Bóg Ó Briain. During this time, Mathghamhain Dall was deposed by his brother Toirdelbhach with the familiar military assistance of the de Burghs (whom he had formed a marriage alliance with). Greater things were to come from the ascent of Toirdelbhach's son Tadhg an Chomhaid Ó Briain. From Inchiquin, Tadhg took advantage of the Wars of the Roses, forming an alliance with the Ó Néill in 1464. He managed to ride south through Desmond (the rest of the old Munster) and enforce the cíos dubh on the Anglo-Normans. This was a kind of Gaelic pizzo which Tadgh's great-grandfather Mathghamhain Maonmhaighe had first been able to enforce as a price of protection. His military prowess was such that the Earl of Desmond was forced to give back to Thomond what would later become County Limerick. Mac Fhirbhisigh hints that the men of Leinster planned to raise Tadhg to the High Kingship of Ireland before his death and claims he was the greatest Ó Briain since Brian Bóruma himself. Thomond was wealthy in the 15th century; Domhnall Mac Gormáin (died 1484) was described as the richest man in Ireland in terms of live stock. During the reign of Conchobhar na Srona Ó Briain, Thomond maintained alliances with the Mac William Uachtar of Clanricarde and the Butlers. In the latter case, they were opposing the Kildare FitzGeralds, earning the ire of Gerald FitzGerald, Earl of Kildare who had earned the favour of the new Tudor king Henry VII as Lord Deputy of Ireland. Despite Kildare's fearsome reputation, Conchobhar met him in battle at Ballyhickey, near Quin, in 1496 and was successful in turning him back. Toirdelbhach Donn Ó Briain as part of his pact with Ulick Fionn Burke took part in the Battle of Knockdoe in 1504; along with the Mac Con Mara and Ó Briain Ara; against the Earl of Kildare, which they lost. The struggle had been started by a feud between de Burgh and the Ui Maine. Ó Briain later defeated Kildare at Moin na Brathair, near Limerick. Thomond intended to support the Ó Néill against the Ó Domhnaill in a northern feud, but by the time Ó Briain arrived, it was over. Toirdelbhach's life came to an end trying to defend the Ó Cearbhaill of Éile from the Earl of Ormond at Camus, near Cashel; he died "by the shot of a ball." The downfall of Thomond occurred in the 16th century. The series of events leading up to it, were set into process by the rebellion of FitzGerald family member, the Earl of Kildare, Silken Thomas. 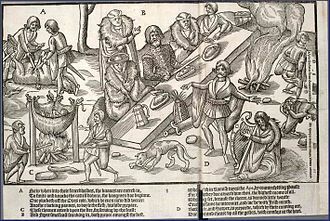 In 1534, a rumour had spread that his father, the Lord Deputy of Ireland, had been executed in England on the orders of king Henry VIII and that the same fate was planned for him and his uncles. Under this impression, Thomas threw off his offices in the Kingdom of Ireland and rose up in rebellion. He took refuge with the Ó Cearbhaill of Éile and then with Conchobhar mac Toirdhealbaig Ó Briain at Clonroad, Ennis. In hot pursuit, at the head of an army, was Lord Leonard Grey, who destroyed the Killaloe Bridge, which had the result of isolating Thomond from the rest of Ireland and also attacked the Dál gCais east of the River Shannon. Although the Silken Thomas issue was resolved by late 1535, Thomond had marked itself out by providing refuge to enemies of the Crown of England in Ireland. The English forces had in turn enlisted the services of Conchobhar's own son Donnchadh Ó Briain who had cemented an alliance with the Butler family by marrying the daughter of the Earl of Ormond. According to Butler, Donnchadh pledged to help them conquer Thomond, aid English colonisation, adopt English laws and help them take over Carrigogunnell Castle. This castle was a symbol of Gaelic defiance, as it had remained out of Anglo-Norman hands for over 200 years. When the castle was attacked by Grey, it surrendered due to Donnchadh. With the loss of east Thomond and the destruction of O'Brien's Bridge, Thomond was in a lot of trouble. Conchobhar, along with loyal supporters such as the Mac Con Mara, continued to fight on and managed to conclude a truce with Grey in 1537. Conchobhar was succeeded on his death by his brother Murchadh Carrach Ó Briain, a man who initially attempted to assist Conn Bacach Ó Néill in the defence of Tír Eoghain but had come to see the futility of his opposition and agreed to surrender and regrant to the Tudor state. 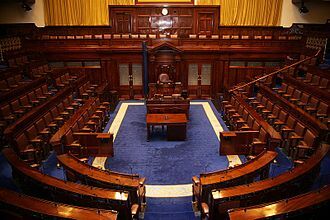 The Parliament of the Kingdom of Ireland was called to Limerick in 1542 by Lord Deputy Anthony St. Leger regarding the terms of submission of Murchadh Carrach Ó Briain and Sioda Mac Con Mara. Becoming members of the Peerage of Ireland and converting to the Anglican Church, Murchadh was made Earl of Thomond and Donnchadh also Baron Ibrackan. Dissent took place in the form of Donchadh's brother Domhnall Ó Briain (and his ally Tadhg Ó Briain) who claimed to have been inaugurated Chief of the Ó Briain according to the Gaelic fashion in 1553. This was in opposition to his nephew the Earl, Conchobhar Groibleach Ó Briain. Tied into English political rivalries, Conchobhar had the support of the Earl of Sussex but was not able to decisively defeat his uncle, indeed Domhnall scored a victory at the Battle of Spancel Hill in 1559. The discord dragged on and Thomond was under the martial law of William Drury as late as 1577. The issues pertaining to tax and land were finalised at the Composition of Thomond in 1585. The religion which predominated at an official level in Thomond was Catholic Christianity. The territory of Thomond was associated with the Diocese of Killaloe under the Bishop of Killaloe, which had been formed in 1111 at the Synod of Ráth Breasail, seven years before Thomond broke fully from the Kingdom of Munster. Dál gCais influence over the Bishop of Limerick differed from time to time, with Norman influence also being part of the picture. At the Synod of Kells in 1152, three more sees in Thomond were created in the form of the Diocese of Kilfenora, the Diocese of Roscrea and the Diocese of Scattery Island. Roscrea was re-merged with Killaloe in 1168 and Scattery Island followed in 1189. The latter was re-created briefly during the 14th century before once again being merged back with Killaloe. Some of the Bishops of Killaloe attended Ecumenical Councils of the Catholic Church in Rome; this includes Constantín Ó Briain who participated in the Third Lateran Council and Conchobhar Ó hÉanna who was at the Fourth Lateran Council. Religious orders were present in Thomond and had establishments founded by them under the patronage of Kings of Thomond. This includes; the Canons Regular of the Augustinians at Canon Island Abbey, Clare Abbey, Inchicronan Priory, Killone Abbey and Limerick Priory, the Cistercians at Holy Cross Abbey, Corcomroe Abbey, Kilcooly Abbey and Monasteranenagh Abbey, the Franciscans at Ennis Abbey, Galbally Friary and Quin Abbey (the latter of which became a formidable college) and the Dominicans at Limerick Blackfriars. There were also many monasteries which predated Thomond such as Inis Cealtra Monastery, Scattery Island Monastery and Dysert O'Dea Monastery. Both St. Flannan's Cathedral in Killaloe and St. Mary's Cathedral in Limerick can be traced to Domhnall Mór Ó Briain. See Annals of Inisfallen (AI). AI927.3 Repose of Mael Corguis Ua Conaill, bishop of Tuad Mumu. AI953.3 Repose of Diarmait son of Aicher, bishop of Tuad Mumu. AI963.4 A slaughter of the Tuad Mumu on the Sinann, and they abandoned their vessels and were drowned. AI1018.2 Ciarmacán Ua Maíl Chaisil, bishop of Tuadmutnu, rested in Christ. ^ The psychological effect that this gesture had on the Normans is evident from when Philip de Braose, Robert FitzStephen and Miles de Cogan rode out to take Limerick city and fled in a great panic upon seeing it in flames. Realising that Domhnall Mór and the Dál gCais would sooner burn it to the ground than have anyone but themselves rule it. ^ The Normans also attempted to takeover the key religious post of Bishop of Killaloe. Geoffrey de Marisco promoted his nephew Robert Travers into the post in 1215, with support of the English monarchy. The Gaels disputed his election to Pope Honorius III and in this case Rome took their side, deposing Travers in 1221 in favour of Domhnall Ó hÉanna. ^ "O'Brien (No. 1.) King of Thomond". LibraryIreland.com. Retrieved on 26 July 2009. ^ Luminarium Encyclopedia: Biography of Sir Henry Sidney (1529–1586). ^ Clare library, retrieved 21 March 2012. ^ a b c Byrne, F.J. Cosgrove, Art, ed. A New History of Ireland II:The trembling sod: Ireland in 1169. Royal Irish Academy. ISBN 9780199539703. ^ a b c "The Normans in Thomond". Joe Power. 21 July 2015. ^ "The Battle of Dysert O'Dea and the Gaelic Resurgence in Thomond". Katharine Simms. 21 July 2015. ^ "Killaloe". Catholic Encyclopedia. 28 November 2015. Frost, James (1893). The History and Topography of the County of Clare: From the Earliest Times to the Beginning of the 18th Century. Nabu Press. ISBN 1147185581. Gleeson, Dermot Florence (1962). A History of the Diocese of Killaloe. M. H. Gill and Son Ltd.
Johnson Westropp, Thomas (1890). Notes on the Sheriffs of County Clare, 1570-1700. Royal Society of Antiquaries of Ireland. MacNamara, Nottidge Charles (1893). The Story of an Irish Sept: Their Character and Struggle to Maintain Their Lands in Clare. Kessinger Publishing. ISBN 1167011775. White, Patrick (1893). History of Clare and the Dalcassian clans of Tipperary, Limerick and Galway. Nabu Press. ISBN 1177212854. The history of Limerick, stretches back to its establishment by the Vikings as a walled city on Kings Island in 812, and its charter in 1197. A great castle was built on the orders of King John in 1200 and it was besieged three times in the 17th century, resulting in the famous Treaty of Limerick and the flight of the defeated Catholic leaders abroad. Much of the city was built during the following Georgian prosperity, today the city has a growing multicultural population. 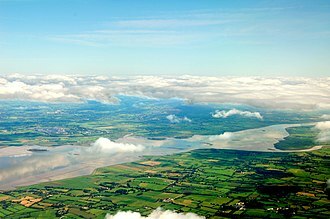 Luimneach originally referred to the area along the banks of the Shannon Estuary. 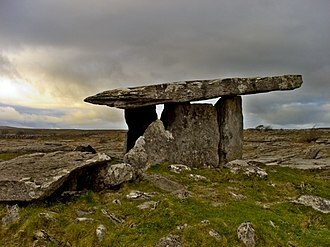 The original pre-Viking and Viking era settlement on Kings Island was known in the annals as Inis Sibhtonn, the name dates from at least 561, but its original meaning is unclear. Early anglicised spellings of the name are Limnigh, Limnagh and Lumnagh, there are numerous places of the same name throughout Ireland. According to P W Joyce in The Origin and History of Irish Names of Places II, others have suggested that the name derives from loimeanach meaning a bare marsh or a spot made bare by feeding horses. The Dindsenchas, attempted to explain the name in a number of ways, connecting it particularly with luimnigthe, Limericks early history is virtually undocumented, other than by the oral tradition, because the vikings were diligent in destroying Irish public records. William Camden wrote that the Irish had been zealous about their antiquity since the deluge and were ambitious to memorialise important events for posterity. The earliest provable settlement dates from 812, history suggests the presence of settlements in the area surrounding Kings Island. Antiquitys map-maker, produced in 150 AD the earliest map of Ireland, History records an important battle involving Cormac mac Airt in 221 and a visit by St. Patrick in 434 to baptise a Eóganachta king, Carthann the Fair. Saint Munchin, the first bishop of Limerick died in 652, in 812 Danes sailed up the Shannon and pillaged the town, burned the monastery of Mungret but were forced to flee when the Irish attacked and killed many of their number. Murrough OBrien, 1st Earl of Thomond was the last King of Thomond, and a descendant of the High King of Ireland, Brian Boru. A member of the Irish nobility, he was the son of Turlough, King of Thomond and his wife, Raghnait MacNamara, and brother of Connor. On his brothers death in 1539 he set aside his nephew Donough and he married Eleanor FitzGerald, daughter of Thomas FitzGerald, Knight of the Valley. 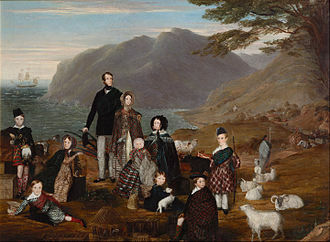 They had three sons and four daughters, in August of that year he joined the kings Privy Council. Lord Thomond died on 7 November 1551 and he was succeeded in the earldom by his nephew Donough according to the special remainder, while the barony of Inchiquin passed to his eldest son Dermod. Another son was Teige Mac Murrough OBrien, who was an early High Sheriff of Thomond, Dermod OBrien, 2nd Baron Inchiquin Teige Mac Murrough OBrien Kidd, Williamson, et al. eds. Leigh Rayments Peerage Pages Lodge, Archdall, the peerage of Ireland, or, A genealogical history of the present nobility of that kingdom. The Norman invasion of Ireland took place in stages during the late 12th century, at a time when Gaelic Ireland was made up of several kingdoms, with a High King claiming lordship over all. In May 1169, Cambro-Norman mercenaries landed in Ireland at the request of Diarmait Mac Murchada, the ousted King of Leinster and the Normans seized Leinster within weeks and launched raids into neighbouring kingdoms. This military intervention had the backing of King Henry II of England and was authorized by Pope Adrian IV, and there and the high king stood strong and lay down too led by Richard Strongbow de Clare. By May 1171, Strongbow had assumed control of Leinster and seized the Norse-Irish city kingdoms of Dublin and that summer, High King Ruaidrí Ua Conchobair led an Irish counteroffensive against the Normans, but they managed to hold most of their conquered territory. In October 1171, King Henry landed a large Anglo-Norman army in Ireland to establish control over both the Cambro-Normans and the Irish, the Norman lords handed their conquered territory to Henry. He let Strongbow hold Leinster in fief and declared the cities to be crown land, many Irish kings submitted to him, likely in the hope that he would curb Norman expansion. Henry, granted the kingdom of Meath to Hugh de Lacy. After Henrys departure in 1172, Norman expansion and Irish counteroffensives continued, the 1175 Treaty of Windsor acknowledged Henry as overlord of the conquered territory and Ruaidrí as overlord of the rest of Ireland, with Ruaidrí swearing fealty to Henry. However, the Treaty soon fell apart, the Anglo-Norman lords continued to invade Irish kingdoms, in 1177, Henry adopted a new policy. He declared his son John to be Lord of Ireland and authorized the Norman lords to conquer more land, the territory they held became the Lordship of Ireland and formed part of the Angevin Empire. The largely successful nature of the invasion has been attributed to a number of factors and these include the Normans military superiority and programme of castle-building, the lack of a unified opposition from the Irish, and the Churchs support for Henrys intervention. The Norman invasion was a watershed in the history of Ireland, marking the beginning of more than 700 years of direct English and, later, in the 12th century, Gaelic Ireland was made up of several over-kingdoms, which each comprised several lesser kingdoms. 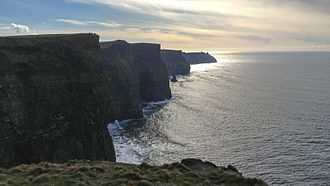 At the top was the High King, who received tribute from the other kings, the five port towns of Dublin, Waterford and Limerick were inhabited by the Norse-Irish and had their own rulers. The Normans had conquered England beginning in 1066, over the following decades, Norman lords conquered much of south Wales and established their own semi-independent lordships there. 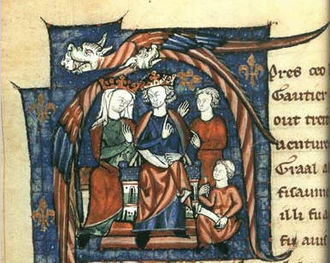 According to historian John Gillingham, after the Norman conquest, a new imperialist attitude emerged among Englands elite, in September 1155, King Henry II of England held a council at Winchester. According to Robert of Torigni, Henry discussed plans to invade Ireland, the plans were put on hold, allegedly due to opposition from his mother, the Empress Matilda. 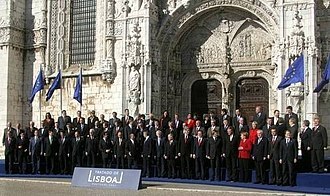 Some of the initiative for invasion may have come from Anglo-Norman church leaders – especially Theobald and that same year, Pope Adrian IV issued the papal bull Laudabiliter, which authorized Henry to conquer Ireland as a means of promoting the Gregorian Reforms in the Irish church. Nenagh is the county town and second largest town in County Tipperary in Ireland. It is a parish in the historical barony of Ormond Lower. It is an Ecclesiastical parish in the Roman Catholic Diocese of Killaloe, Nenagh was originally a market town, and its name in Irish means The Fair of Ormond – a reference to the Ormond Fair, of which it was the site. 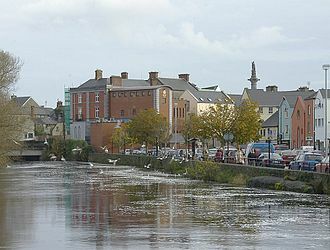 Nenagh is today a commercial town and is governed by Nenagh Town council. The Silvermine Mountain range lies to the south of the town, the Silvermines have been intermittently mined for silver and base metals for over seven hundred years. Traces of 19th century mine workings remain, the towns historic attractions include Nenagh Castle, the Heritage Centre and the ruined Franciscan abbey. It has a climate, with the average daily maximum in July of 19 °C. Nenagh is located in the Barony of Ormond Lower which was the territory of the OKennedys prior to the Norman invasion of Ireland. This land was included in the grant made by King John of England to Theobald, Theobald was subsequently appointed Chief Butler of Ireland. Nenagh Castle was built c.1216 and was the castle of the Butler family before they moved to Gowran. The family purchased Kilkenny Castle which was to be the seat of their power for the next 500 years. The town was one of the ancient manors of the Butlers who received the grant of a fair from Henry VIII of England and they founded the medieval priory and hospital of St John the Baptist, just outside the town at Tyone. A small settlement grew up around the castle, but it never seems to have been of any great importance other than as a market throughout the medieval period. The Abbey was in use for six hundred years, Fr. Patrick Harty, the Butlers who descended from the 1st Baronlater became Earls of Ormond. Nenagh remained their principal seat until 1391 when it was moved to Kilkenny Castle, in the rebellion of 1641 Neagh Castle was garrisoned by Sir George Hamilton for the twelfth Earl. After the Restoration, Sir William Flower came along in 1660 on behalf of the Marchioness of Ormond who had the ownership of the Manor on her marriage settlements, the last Marquess died in 1997. Caherconree in the Slieve Mish Mountains features the remains of a stone ringfort, named for Dáirine king Cú Roí. Skellig Michael off the coast of the Iveragh Peninsula. An isolated Christian monastery was founded here by St. Finnian of Clonard in the 6th century. The Rock of Cashel was the centre of power for the Eóganacht Chaisil, ancestors of the Mac Cárthaigh, who became the main providers of Kings of Munster. St. Cormac mac Cuilennáin was a celebrated early 10th century King-Bishop associated with the literary Sanas Cormaic. The Bayeux Tapestry's depiction of the Battle of Hastings. Although Arnulf's family did not participate in the invasion of England in 1066, it was richly rewarded with English lands soon afterwards. Seal of William Rufus. The device depicts the armament of a late eleventh-century mounted knight. William Rufus as depicted on folio 5r of British Library Royal MS 14 B VI. The ruinous castle of Bridgnorth. After the castle's fall to Henry's forces in 1102, the Bellême-Montgomery rebellion quickly collapsed. The Marriage of Aoife and Strongbow; a romanticized depiction of the union outside the ruins of Waterford by Daniel Maclise. Much of the initial Norman Invasion of Ireland occurred within and around Osraige's borders. Image of William Marshal unseating a jousting knight. Marshal was considered the greatest knight in Christendom during his day. A stained glass window icon of St. Ciarán of Saighir. 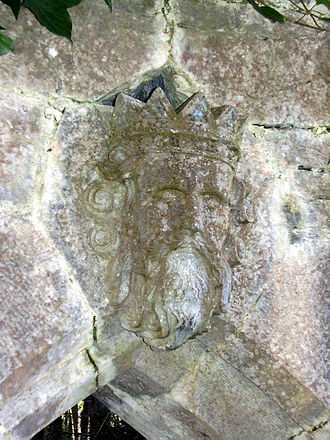 A public bust of St. Cainneach in Kilkenny City, whose 6th-century church was founded there. Stained glass window in Tewkesbury Abbey depicting Lord Gilbert de Clare. 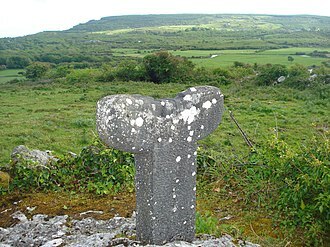 Middle Irish inscription from Clonmacnoise: Oroit ar Thurcain lasan dernad in chrossa: "Pray for Turcan by whom this cross was made." Saint Patrick's Shrine, now in the National Museum of Ireland, Dublin; an inscription on the rear begins "Pray for Domnall Ua Lochlainn on whose order this bell was made..."
The Cross of Cong, a reliquary and processional cross that contains a piece of the True Cross, was commissioned by Toirdelbach and made at Roscommon. The Cathedral of Saint Mary Blessed Virgin, Limerick, founded by Donall O'Brien and also where he is buried.